Waffles for kids are a simple way to get breakfast into your kids without having to overthink or spend all morning slaving over a stove. These fun kids waffles are the perfect mix of fun breakfast for kids and simple breakfast for mom. Make it a healthy well rounded breakfast with tips for choosing a healthy frozen waffle for kids and using whole fruits and healthy fats to increase the nutrition. This post was originally posted on May 25, 2017 and was last updated April 18, 2018. In general, I enjoy making things myself rather than buying them pre-made. But the reality is, I’m no super mom. By any means. While I wish I had the energy to make every little thing from scratch, unless I want to drop one of the dozen or so balls I’m constantly jugging, it just isn’t going to happen. Which brings us to frozen waffles. 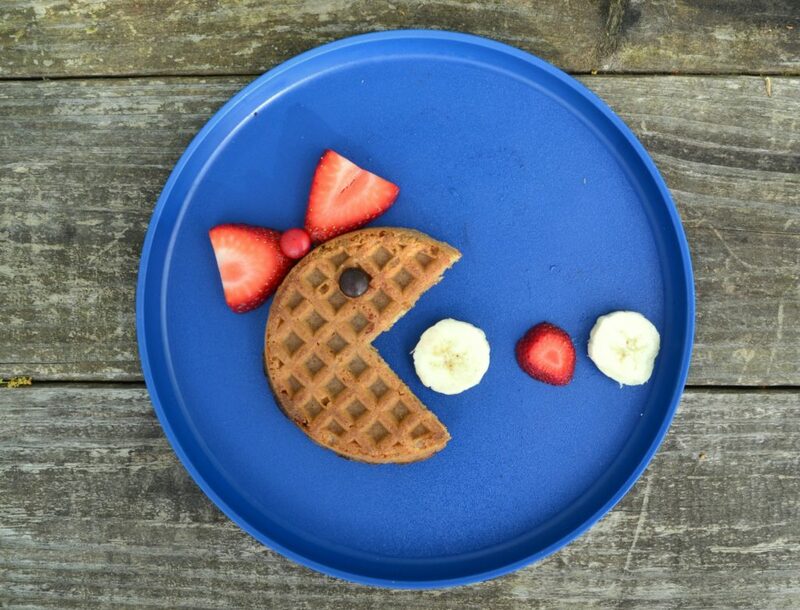 Frozen waffles are pretty much the perfect base for fun kid food. They’re super versatile, but still a waffle which kids love. They’re relatively affordable and these days you can find so many different kinds out there that will fit your needs – gluten-free, whole grain, packed with hidden veggies, chocolate chip, blueberry – whatever your little heart desires, it’s probably out there. After I made my post about turning toast into a fun breakfast, my mind started reeling thinking about other simple things I could turn into fun food. The obvious progression was waffles, partially because I enjoy waffles and partially because they’re the perfect shape for a bunch of cool things. 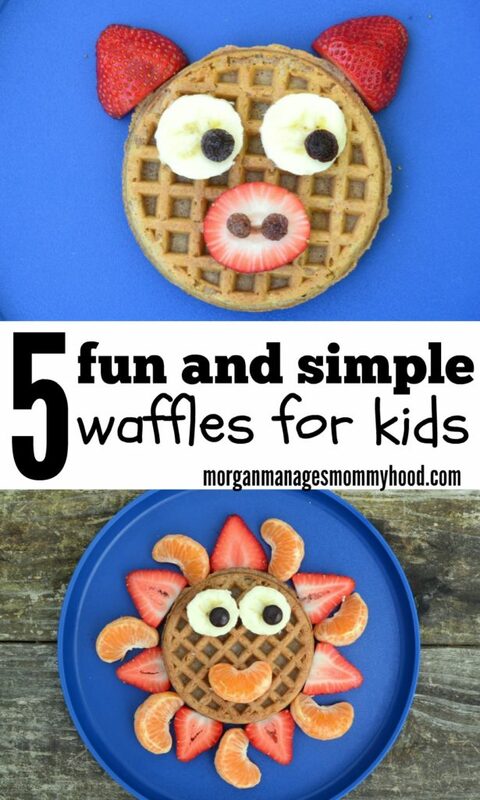 I went experimenting and came up with 5 super simple waffles for kids that anyone will love. So grab a box of frozen waffles and get a toastin’ – your kids are going to love these! Tip: if using raisins, squish it lengthwise to create a small circle. Toast your waffle and cut a triangle out of the side. Cut a strawberry into 2 triangle slices. Place on the top of the waffle with a red candy in the middle to create a bow. Alternatively, you could use the tip of a strawberry or a raspberry to create the center of the bow. Create an eye with a chocolate chip, raisin, or chocolate candy. Finally, add circle shaped fruits in front of the ‘mouth’ to ‘feed’ Mrs. PacMan. While your waffle toasts, segment a clementine or mandarin orange. Slice a strawberry into triangle shapes. 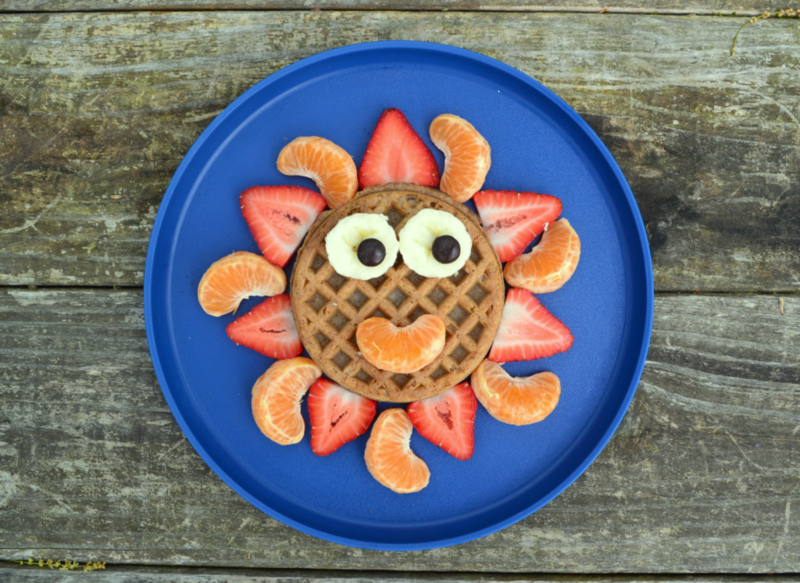 Around the waffle, alternate clementine segments and strawberries to create rays of the sun. Add a segment for the mouth and 2 slices of banana topped with chocolate candy as eyes. Toast your waffle and cut 2 or 3 strawberries into strips to expose the red skin. In the upper left hand corner, place blueberries into the waffle holes over one-fourth of the waffle. 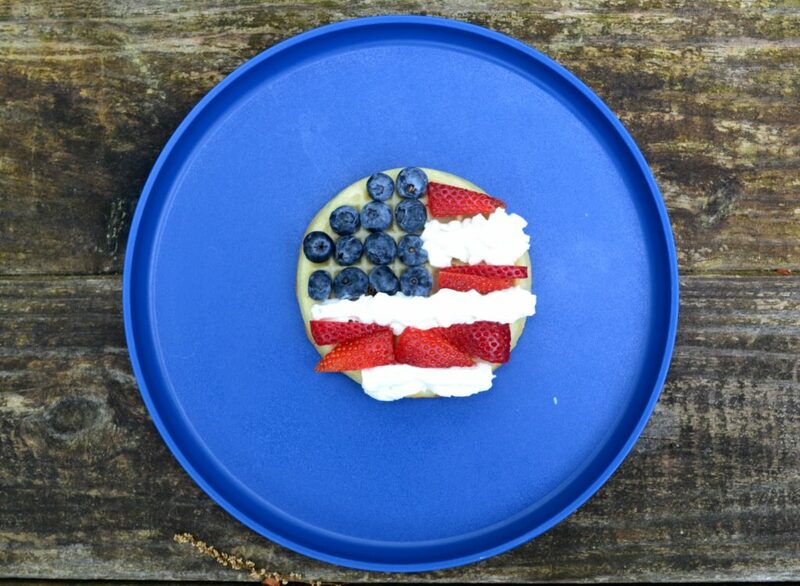 Stripe strawberries and whipped cream (you could also use plain yogurt or cream cheese, or banana slices instead) to create an American flag. Toast your waffle and slice a small triangle out of a clementine. Continue cutting your fruits by cutting a circle from the side of an apple and cutting it in half, and slicing a banana. Spread your waffle with nut butter and place the apple halves on each side of the waffle as wings. Layer round cereal onto the belly of your owl and make banana eyes with the slices and raisins and a beak with the clementine. Use apple scraps to create a sprout of fur at the your of your owl’s head, heart shaped cereal for feet (I used Kashi) and flake cereal layered over the wings as feathers. Tip: If you don’t have the right shaded cereal for feet, try more orange triangle. 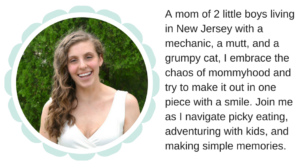 Sold on the ease of frozen waffles and want to try some of these fun takes with your own kids? Before you grab the first box of frozen waffles you see, make sure you check out the labels to make sure you are getting a good option for your family. Here are some tips for choosing frozen kids waffles. Whole grains. When possible, I grab a whole wheat variety. Waffles are fun, but they aren’t the most nutrient packed breakfast option. Since we’re starting the day with them in most cases, try to get as much good stuff in as early as possible! Salt. Check the sodium before purchasing. It’s easy for processed foods to add salt to things as a way to increase flavor. Cooking Light suggests looking for one with 200-300 mg of salt per serving. Other bonuses. Some brands offer different ‘bonuses’ in their waffles – added vitamins, gluten free, flax, etc. Garden Lite makes one that has hidden veggies that my boys adore. Simple, right? None of these kids waffles take more than 2 minutes to put together and it will help encourage your kiddos to eat their fruit! Give the kids an option to pick out what kind of waffle they want to make. 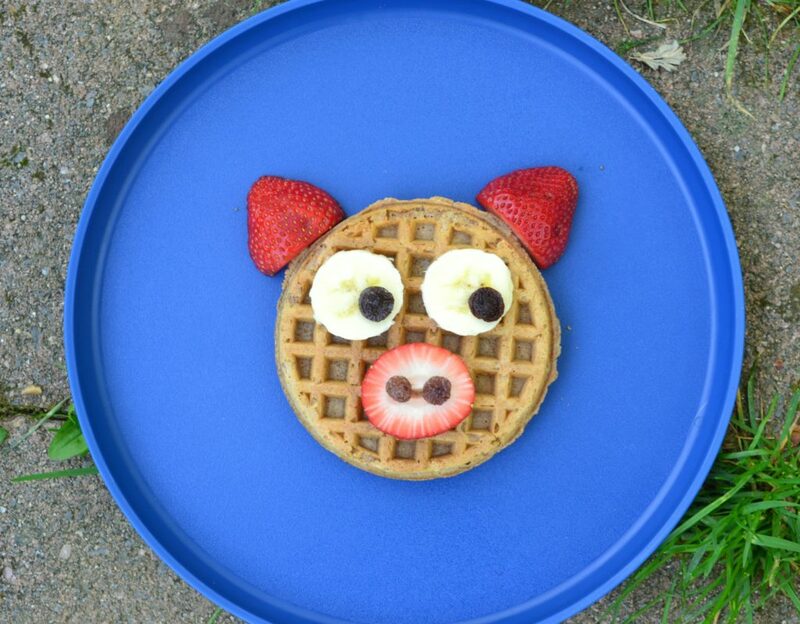 Do all of the slicing and then have them decorate the kids waffles! Want to get some veggies in? Use a hidden veggie waffle – either store bought or make your own! Pinterest has a ton of great options. So tell me – do you like making your kids’ food fun? What are you favorite ways to do so? Let me know in the comments! 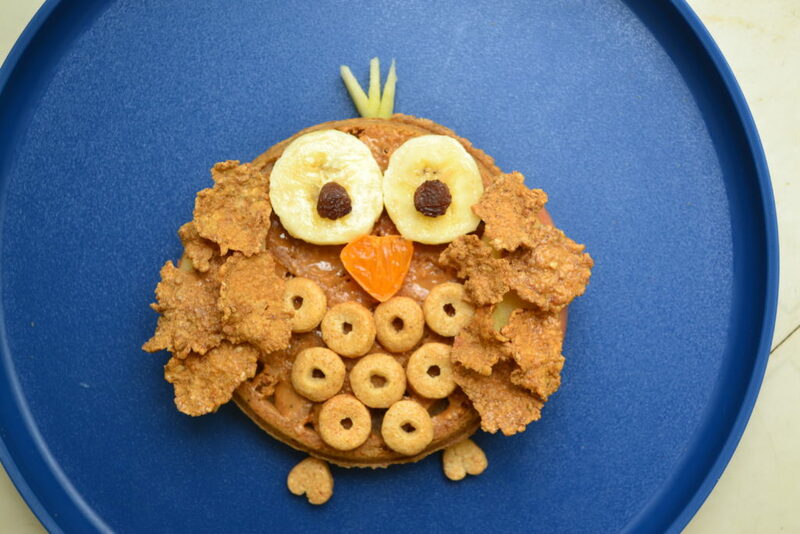 If you liked these waffles for kids, you may also enjoy these posts! Find all of my favorite breakfast recipes for kids here! My kids love waffles so I will have to try some of these! So cute! The pacman waffle is absolutely adorable! What easy ways to make breakfast fun for kids! I just told my kids that this weekend I wanted to buy a waffle maker and now I’m gonna def. do that. Yummy recipes. Do you have a specific waffle recipe you use? Not gonna lie, I’ll likely be using boxed! LOL!